Police investigate a shooting at 201 Center Street in Bangor on Friday that left one dead and one injured. 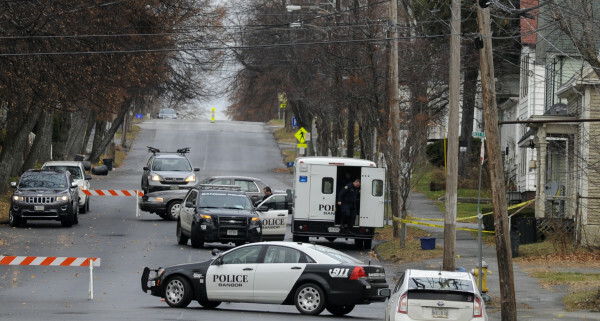 BANGOR, Maine — Two suspects were taken into custody about 7 p.m. Friday in connection with the early morning shootings at a Center Street duplex that left one man dead and another wounded, according to city police. Robert Hansley, 27, and Thomas Ferguson, 37, both of Brooklyn, New York, were arrested and will be charged with murder and elevated aggravated assault, Sgt. Tim Cotton said Friday night in a news release. Officers and members of the tactical team converged on Hammond Street and Webster Avenue about 6:30 p.m. Friday. Once the suspects were in custody, officers left the scene and a car was towed from the area. The outbound lane of Hammond Street was shut down while police took the suspects into custody. Cotton said he could not speculate on why the shooting occurred. Hansley and Ferguson, who will be held at the Penobscot County Jail once interviews have been completed, are expected to make their first court appearances at the Penobscot Judicial Center Monday or Tuesday. If convicted of murder, each man faces between 25 years and life in prison. The names of the victims have not been released. However, Cotton said that the wounded man was able to speak with detectives Friday afternoon after surgery and is expected to recover. Police originally went to 201 Center St. at 3:30 a.m., according to Cotton, and were there throughout the day Friday. The body had not yet been removed from the house as of Friday afternoon, he said, adding that the medical examiner would be investigating. An autopsy is scheduled for Sunday. Cotton said Friday night that he expected the identity of the dead man would be released after the autopsy is completed. The sergeant expected the building would be secured throughout the weekend, as investigators may need more time and better lighting in order to complete the investigation. Crime scene investigators, after working throughout the morning inside the building, placed evidence markers on the porch and stairs leading to the apartment and took photographs of the area in the afternoon. A small section of Center Street was cordoned off to traffic shortly after police arrived until about 5 p.m. Friday. Several neighbors reported hearing sirens early in the morning, but said that’s not unusual with St. Joseph Hospital just up the road. BDN writers Nick McCrea and Ryan McLaughlin contributed to this report.